Used in a wide variety of industrial and retail settings, roll containers are best used for transporting supplies or stock from one location to another. 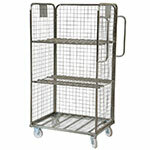 If you need a roll cage trolley to transport your goods in the warehouse, we’re confident that we have one to match your exact requirements. Our vibrant yellow epoxy coated plastic based roll container isn’t just an eye-catcher – the red plastic base has steel reinforcements and will comfortably carry loads of up to 500kg. 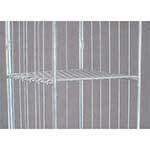 It comes in a two-sided or three-sided design and has optional shelves. If storage space is a little tight, our 600kg capacity nestable roll containers may be the ideal solution as their sides fold in for easily nesting together when not in use. 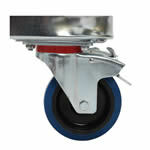 Resting on large nylon castors with roller bearings, this zinc-electroplated trolley compactly folds away in an instant to rest in compact blocks when not in use, and comes in three - or four-sided designs (there’s an optional hinged shelf, too!). 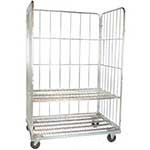 These are widely used in the retail industry in supermarkets and smaller shops. 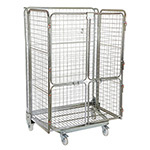 For ultra-strong security, our 500kg demountable, lockable security roll trolley really takes some beating and is ideal for moving high risk loads. 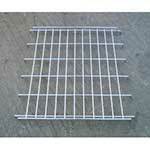 Surrounded by 50mm x 50mm wire mesh on all sides and on the top, it can be security tagged or padlocked. 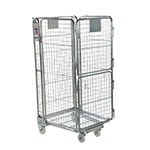 In our demountable roll cages, contents remain secure and protected whilst in transit, the strong, zinc plated steel wire is resistant to dents and damage. 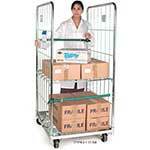 Even with heavy use, you will find them capable of living with the demands of busy warehouses. Our containers also have safety devices such as braked castors which will prevent the roll cage from moving whilst being loaded. 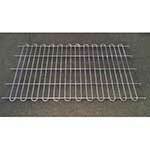 This is especially important when it comes to jumbo size, as these can carry a significant amount of weight. 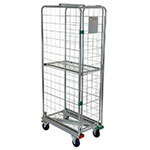 Within our wide range of roll containers we include everything from secure demountable through to narrow aisle models. 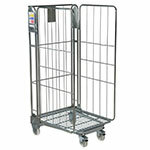 Narrow aisle roll cages are especially good where you have pallet racking spaced close together, leaving little room for moving between them. If access is important to your cage, then you have the choice between fully opening front doors or a drop gate. 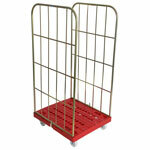 The drop gate will allow access to the contents without allowing stock to spill out.